The AIS is a very useful device when blue water cruising, as it allows boats of all sizes to see and be seen by other vessels within range of VHF. Here is the new B&G AIS Class B transponder: the NAIS-500. Compatible, via NMEA 2000, this small box barely weighing 250 grams is a real guarantee of safety on board. Price: from 878.90 euros ex-tax. Designed for water sports activities, the new Garmin Quatix 5 GPS watch is waterproof up to 100m and can be synchronized with Garmin's onboard devices, giving you all the information you need for sailing. It can even be used as a remote control for the autopilot! Mastervolt has just introduced a new waterproof monitor. Easyview 5 is an extra-flat color screen specially designed to be used even in direct sunlight. A way to keep an eye on every aspect of your electrical system. 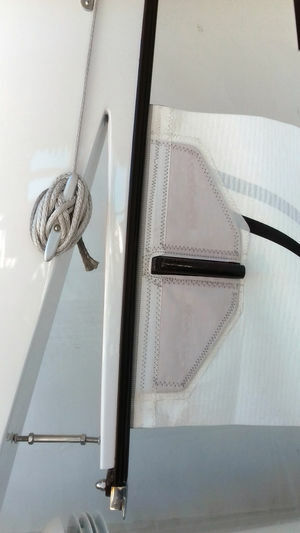 Known for their anti-capsize systems on multihull offshore racing boats, Ocean Data System offers many solutions for long-distance cruising boats such as remotely releasing sheets, load measurement on various lines or shrouds but also the possibility to combine some of the elements to give an optimized deck layout. To always be perfectly at ease when sailing, you need powerful, intuitive software and charts regularly updated. This is the way with ScanNav whose latest update (17.1) can be installed on a netbook or a tablet, even a basic-level model. ScanNav also offers a new routing module. In-boom furling systems are practical, but ... batten boxes are sometimes problematic. Here is a brand new soft carbon case that guides the batten and prevents it from moving forward as it enters the feeder. Simple, convenient and ... very useful! You can’t really leave to head off around the world without a good gennaker. And you mustn’t carry a good gennaker without an excellent furler! Profurl offers a range of 6 models of boats called NEX for boats from 6 to over 25 m.
Harken have just launched two new pulleys in their V Block Line range with the 5T and 8T. With 8,000 kg of load, the 8T is particularly suitable for large catamarans and has the advantage of being as efficient and easy to handle under heavy loads or light loads.